The motor vessel Manoora was built for the Adelaide Steamship Company in Glasgow by A. Stephens and Sons and entered service on the Cairns – Fremantle run in 1935. After the outbreak of war she was requisitioned by the Royal Australian Navy on 11 October 1939 for service as an Armed Merchant Cruiser and outfitted in Sydney. She was commissioned on 12 December 1939 and her conversion was completed on 5 February 1940. After trials and exercises in Port Phillip Bay she returned to Sydney before proceeding to northern Queensland waters. In 1942, the ship was converted into the RAN’s first Landing Ship, Infantry (LSI). After extensive training, Manoora was involved in most of the Allied amphibious operations in the Pacific during 1944 and 1945. After the war’s end, the ship was used to transport occupation forces and refugees until 1947, when she was decommissioned from naval service and returned to the Adelaide Steamship Company on 31 August 1949. Manoora continued to operate in Australian waters until 1961, when she was sold to an Indonesian company and renamed Albulombo. The ship was sold for scrap in 1972. Shown below are some menus used by the ship’s company when serving passengers in May and August 1937. 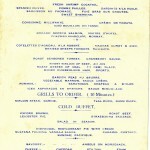 Menu from TSMV MANOORA for Sunday, 9 May 1937. 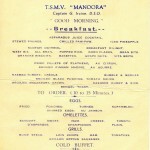 Menu from TSMV MANOORA for Friday, 20 August 1937.